Commission completed. Acrylic on stretched canvas. I provided shipping. Oil and cold wax medium on cradled panel. A blustery day on Lake Superior with fleeting clouds and rushing waves. In oil and cold wax on cradled panel, wired ready to hang. Available at Downtown Art Place in Ironwood MI, 906-285-7300; they can ship! Let's go up north! 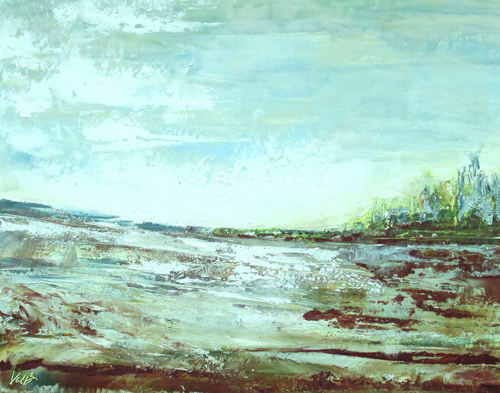 Oil paint and cold wax medium (think buttery frosting!) applied like finger-painting on crazy textures. 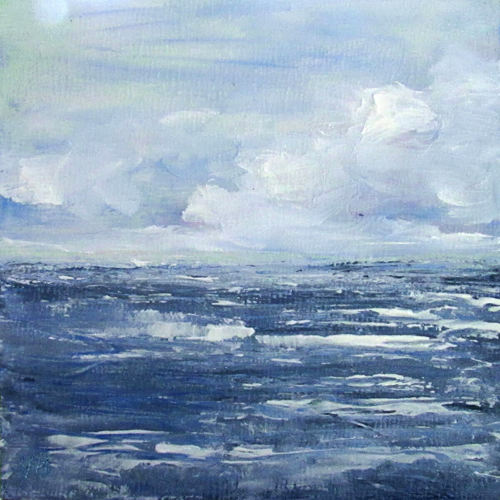 On a flat canvas panel, needs your frame. Shown below is an idea for framing. Sale price includes UPS shipping. 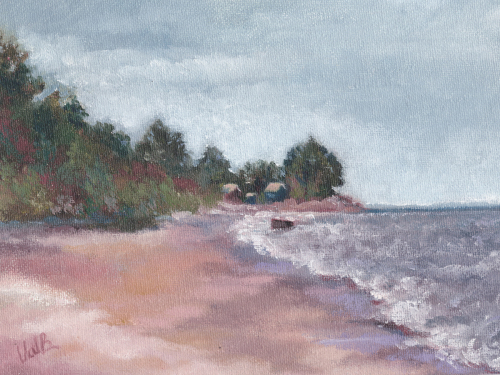 Plein air at Little Girl's Point park Oman's Beach in Michigan's U.P., Lake Superior's south shore. Available directly through me. UPS shipping to USA included in price. 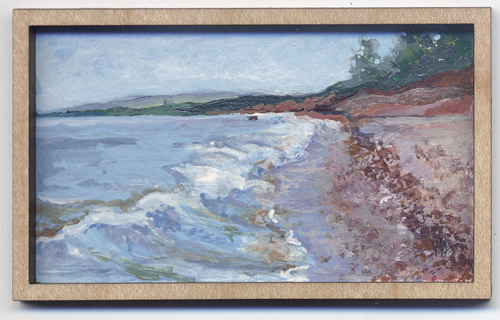 6"x8" oil on flat panel will need your open-back frame. Yupo is a non-absorbent synthetic paper that allows watercolors to float on the surface. Very fresh color! 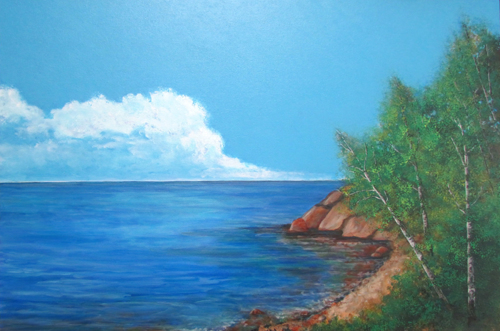 This Lake Superior inspired painting is only 8x6 but matted to be 16x12 to fit your frame. Available directly through me. Sale price includes shipping to USA. 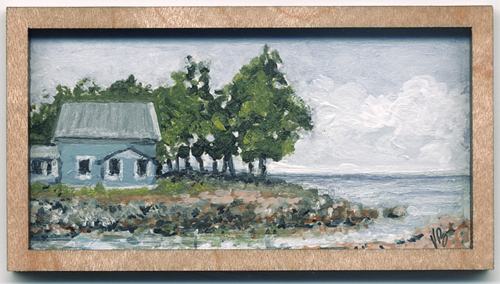 Something new and adorable from my studio: miniature landscapes inspired by Little Girl's Point on Lake Superior. This is a genuine original oil painting done on a genuine real rock I picked up from the beach. Approximately 2 inches round. Priced in consideration of shipping lovingly packed in a gift box. Available directly through me. 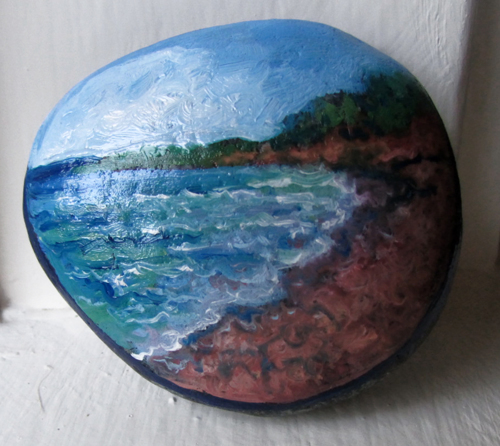 #berkelydesign #valberkely #lakesuperior #littlegirlspoint #paintedrocks Commission one for yourself! 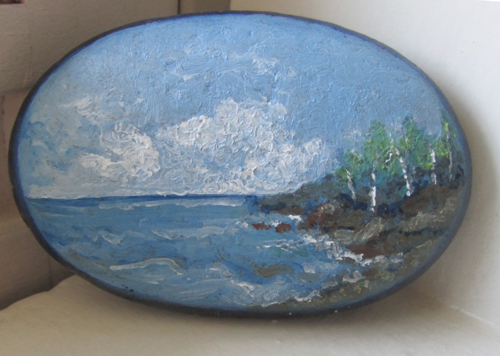 Another adorable rock from my studio: miniature landscapes inspired by Little Girl's Point on Lake Superior. 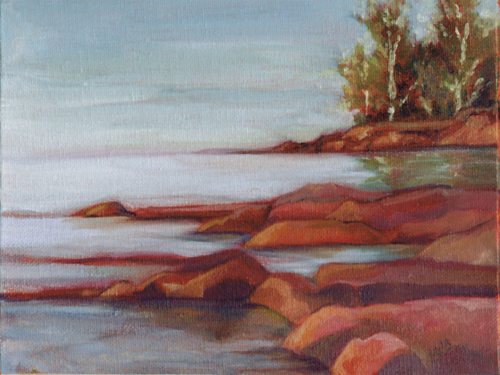 This is a genuine original oil painting (with lots of texture) done on a genuine real rock I picked up from the beach. Approximately 2.5 x 1.5 inches oval. Priced in consideration of shipping lovingly packed in a cute natural wood gift box. Available directly through me. I can ship direct to your heart's desire. 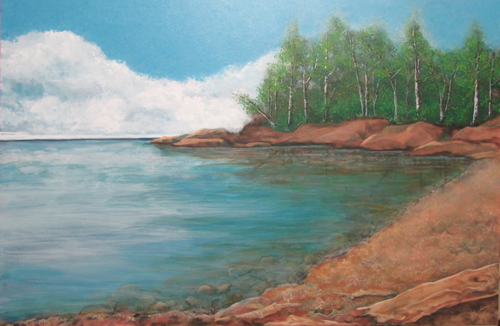 #berkelydesign #valberkely #lakesuperior #littlegirlspoint #paintedrocks. Commission one for yourself! 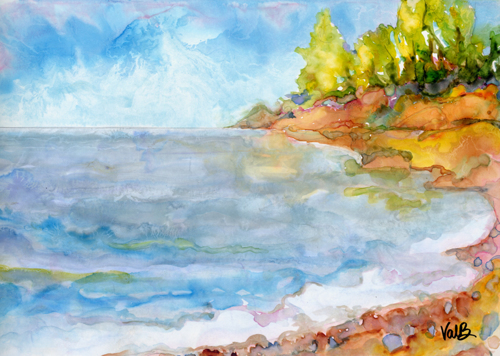 Last summer, I invited my best friend to visit my art studio cabin on Lake Superior. She had never seen this Great Lake! She spent many happy hours over a three day weekend watching the waves and finding treasures ... stones! Afterward, she inspired me to "document" our Three Day Weekend. 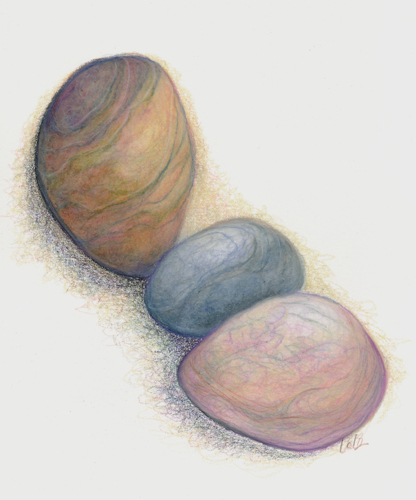 NEW technique for my art: Color Pencil Drawing produced on an ICARUS heated drawing board. (Look up the artist Ester Roi, she invented it!) Basically, the glass-like tabletop surface has a cool area and a warm area -- you can control the heat level. 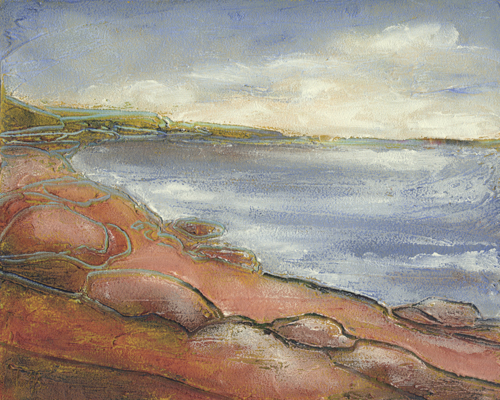 It is wonderful for blending the wax-based color pencil for soft layers. Look closely; you will see that I intentionally did not blend the shadow areas. This piece on archival paper is only 7"x 9" but it is matted and sleeved to be 11"x 14" overall. Ready for your standard framing; I recommend a UV protection glazing. My price includes USPS or UPS shipping to USA only. I am sorry that I do not do international shipping. On cradled panel, wired to hang, but stands great on a shelf. 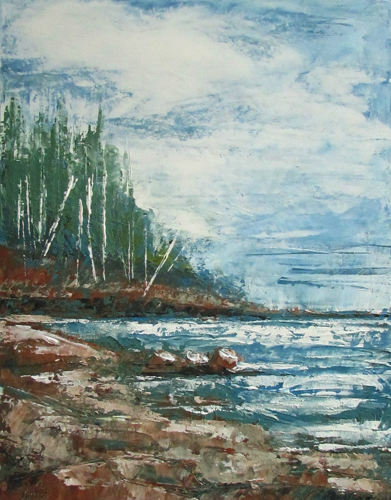 Acrylic textures inspired by the stones I find (and bring home!) from Lake Superior. Sale Price includes UPS shipping to USA.